Help your daughter, granddaughter, or neice become a respectful, considerate young lady. Its safe to say that young women in the 21st century are exposed to more educational opportunities than any generation of women in history. But sometimes what gets lost in between ballet and biology, AP classes and piano lessons, creative writing and cross country, are the basic rules of simple etiquette and guidelines for appropriate behavior. Progress is a good thing, but even an accomplished student, a gifted artist, or a brilliant young law clerk is at a disadvantage if she never learned to write a thank you note, understand a formal table setting, accept a compliment, make an apology, express sympathy, or respond to an invitation. This latest book in the GentleManners series was written especially for girls ages 8 to 14, to teach them the basic skills every young lady should have and every young lady's mother and grandmother want her to have. 50 Things Every Young Lady Should Know H by Bryan Curtis; John Bridges; Kay West was published by Thomas Nelson in October 2011 and is our 24378th best seller. The ISBN for 50 Things Every Young Lady Should Know H is 9781401600648. 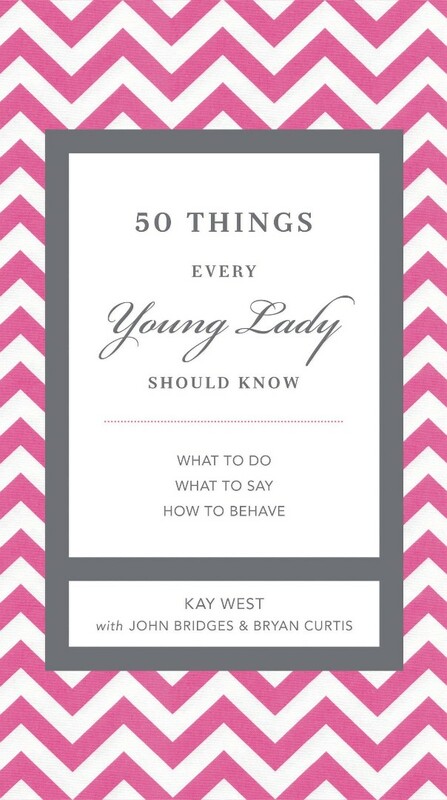 Be the first to review 50 Things Every Young Lady Should Know H! Got a question? No problem! Just click here to ask us about 50 Things Every Young Lady Should Know H.